California-based Airborne Wireless Network (AWN) believes, like Facebook envisions, that it has the answer for being able to assist in providing broadband throughout the world by using aircraft. Whereas Facebook is attempting to use unmanned drones, with its first attempt ending in a return-trip crash, AWN want to use the world’s existing commercial aircraft to create a meshed carrier network. The company said that by using planes as “mini-satellites” for its network there are numerous advantages such as their ability to maintain the system as planes land and are oftentimes parked for periods of time. They also throw in the just say no to junk in space as a sweetener for their system. The company said the network would provide nodes that are all talking to several other nodes simultaneously, and if a one link goes down, it will not create a problem with providing a stable service. However, one concern for those relying upon its service will be the loss of communications during a catastrophic event such as when all aircraft in the United States were grounded immediately following the 9/11 attacks. But the system seems to provide for a line-of-sight range of the plane’s flight path, and it is unlikely that many unserved areas of the world, such as Sub-Saharan Africa, would benefit from the network. AWN says that with their network, there will be no single point of failure because there is always another aircraft, ship or earth station within range of the aircraft. 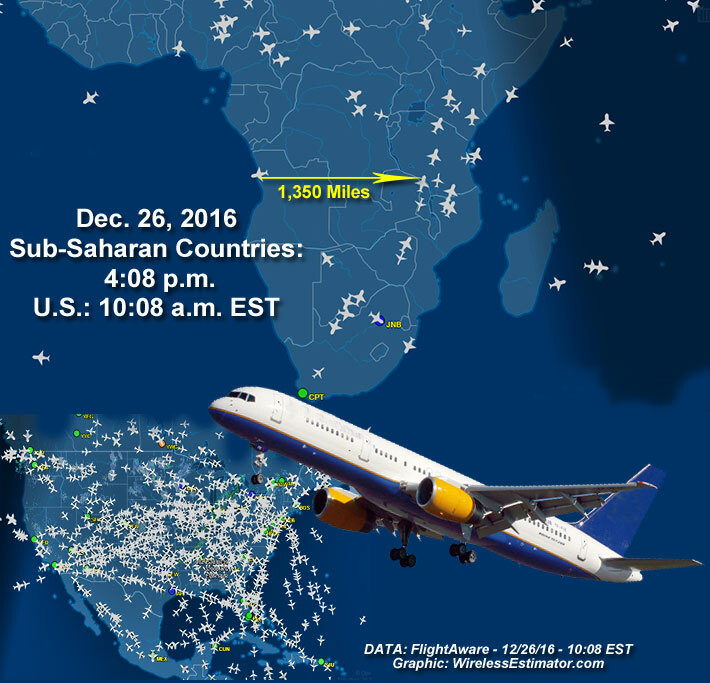 A Dec. 26, 2016 high-traffic period for Sub-Saharan Africa obtained from FlightAware by Wireless Estimator, shows at 4:08 p.m. West Africa Time that in many countries there were no commercial flights within 1,000 miles of each other. If AWN’s wholesale carrier network’s flying broadband pipeline becomes a reality, the company said it will not interfere with existing onboard aircraft systems. Looking to the future, the company said it intends to cross into the cockpit and provide essential services with true broadband data to the flight crews, the FAA, and airlines, enabling unprecedented aircraft location services as well as other aviation safety applications independent of satellite coverage. On Nov. 22, 2016, AWN closed on a $1.2 million private placement funding transaction, selling 1.5 million of its shares to a non-U.S. investor for $0.80 per share, and allowing the individual to warrant to purchase for a period of one year an additional 1.5 million shares of the company’s stock at a price of $1.25 per share. The stock (ABWN), near closing today, was at $1.40.